Project for optimizing build speed by reducing unnecessary project\lib copying. Project also can show independent projects in your solution and check all lib reference on the same versions and .dll paths. Download this extension from the VS Gallery. 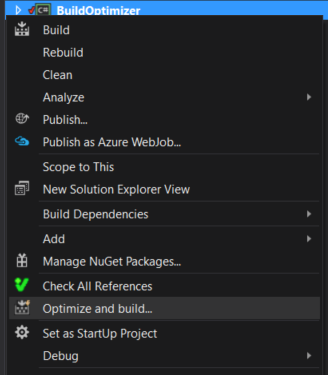 Visual Studio extension for optimizing build speed by reducing unnecessary project\lib copying. Project also can show non-referenced projects in your solution and check all lib reference on the same versions and .dll paths. You should use optimized build just if your main project have many project references with the same libs. Otherwise you don't get any time and memory excellence. Then solution's copy autobuild starts. After that, you can saw some build errors. It can happen because of the same names in different namespaces for example. In that case, yoy can open solution copy (it won't be deleted while cmd window is open) and fix all problems. Select solution in solution explorer and right-click. You can check projects by one before building. (Or you can saw too many errors in window =) ) There probably will be many warnings with different versions of the same lib. That's because lib's version info in *.csproj file doesn't always actual and correct. 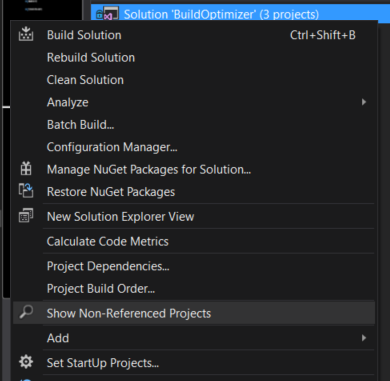 Select project in solution explorer and right-click. The work of this command is described in detail in "How does it works?" 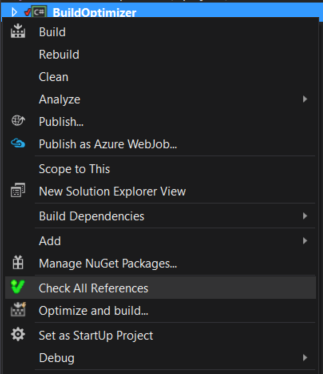 Cmd window with msbuild utility will be launched.